Panda Kopanda is the story of Mimiko, a little girl who gained the companionship of two pandas after her grandmother left on a trip. The story about this funny family is very cute and happy-go-lucky. The art is the same style as My Neighbor Totoro, and the backgrounds are quite detailed. The characters have flat coloring for the most part, but I think it fits with how they are drawn. The opening/ending song makes an apperance in the actual anime, unlike most anime I've seen. The music picked for the scenes fits very well, and some scenes don't have background music. Sound effects like chewing and rain make up for the lack of background music. Both the sound effects and music add to the anime. There are many characters, but Mimiko and the pandas are the main ones. The background characters all look a bit different, instead of just being a sea of similar faces. I throughly enjoyed both movies. As a lover of all that is cute, an anime about pandas was perfect for me. The movies are only a little over 30 minutes long each, so they don't drag out, but have enough action for the short time used. Overall, I think anyone who likes My Neighbor Totoro or cute things would like this, and it is appropriate for all ages. This is one of my many childhood favorites. Ahh I remember back then jumping on the bed yelling "Panda, panda" and trying to comprehend the foreign language (i bought it on dvd with no subs). The story is cute so it deserves a 9. The art is ok....I mean they did shirk in some of the scenes (like the animal train) but other than that the panda drawing is outright adorable. The character themselves, though, are a different story. They are cute, they are sweet and they are something out of the universe (literally). The enjoyment is lovely, a magnificent way to relieve stress since the story has no logic at all. I mean little girl living with pandas, who eat tons of bamboos per day, is fine? Animals that are able to hold their breath underwater for a long while? Pandas that are really hulk on the inside? And lastly, the one that flabbergasted me the most, horses can eat cookies. Overall 10!! I recommend this to the innocent souls out there!! I came home to the next gray weekday after study. This routine can dement everybody. That to relax, I decided to watch the last long ago downloaded animated film about the Panda. I take a cup of tea in a hand to bring to a mouth and I fade:« Panda Papanda Kopanda …». A remarkable and fine animated cartoon and despite that it is intended on very young audience. The animated film tells about little girl Mimiko who turned from the orphan into the daughter and loving mother one fine day. She is absolutely child still but she is quite independent. The big panda is an ideal of fathers. Speaking that each child should have a father he becomes it for Mimiko. Together with the Mimiko, the father panda and the panda's son you are dipped into other world, the world of pandas and boundless pleasure, children's naivety. Bright paints operate awakening. It would be desirable to dance and sing. 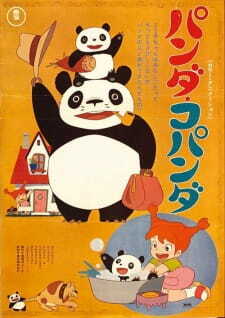 Panda Kopanda is a pair of sort films from the early 1970s. Yes, that is even older than me. It was put out by Tokyo Movie Shinsha. You may remember them as the studio behind Magic Knight Rayearth & Versailles no Bara. That might give you low expectations but it was also written by Miyazaki Hayao, back before Studio Ghibli was a thing. And he's done screenplays for some of the best anime films out there. So, get your expectations away from mediocrity or worse. We open with young Mimiko seeing her grandmother off. Apparently it was time for the old bat to go into a home. (Actually, she's going on a trip and can't take Mimiko because she has school.) While on her own, Mimiko finds out that something strange happened while she was out. She swiftly finds the culprit and it's a baby panda named Pan-chan. Pan-chan's father arrives and is very upset to learn that Mimiko has no parents. So, he decides that he'll be her father and, in exchange, she says she'll act as Pan-chan's mum. I know that sounds really questionable, but it isn't. Thus the trio forms a bizarre little family. The biggest issue with the films is, ultimately, that it doesn't always take full advantage of its scenarios. For example, there's a segment where Mimiko takes Pan-chan to school and some shenanigans ensue. But, ultimately, considerably more could have been done with this. Then there's the grandmother. Mimiko having a grandmother doesn't really do anything. Theoretically, she'll get back from her trip at some point and that will lead to something, but there were only two films and that never came to fruition. Having her departure scene doesn't really do anything and having Mimiko write to her doesn't really do anything. Although, tying into the first point, there could have been a really funny scene of the grandmother reading the initial letter and misunderstanding it. It also is a bit weird that some animals talk and others don't. Most of the circus animals, for instance, don't say anything. With that being said, the content they do have is fun and it has a real charm to it. Watching the characters interact with circus animals is fun. The stuff we do get at the school is enjoyable. The initial meeting with the characters is a fun time. There's never a moment where what's on the screen is just nothing. Miyazaki also does a good job of bringing in some minor sources of tension for the children. As adults, we know it's going to turn out okay but for the intended audience, they work well. The cast is simple, but they're entertaining. Honestly, their interactions and dynamics are strong enough for a work with a comedic bent. Even if it was intended for older audiences they'd be perfectly functional in that regard. The artwork definitely shows its age. It uses that really old school style where the animation is a bit janky and the art style is very basic. Honestly, though, it holds up pretty well. You'll never confuse it for a newer series, but the bright vibrant colours and simplistic style do have their own sense of charm when they're used well. Our little family is voiced by Kumakura Kazuo, Oota Yoshiko and Sugiyama Kazuko. You might not be super familiar with them since a lot of their acting roles are in older anime but they all give solid performances. The music is very energetic and just fun. There isn't any romance whatsoever in this. So, no ho-yay. And, in this case, that's a good thing. Now it's time for me to present those changes that I think could have made for a better work. Cut out the grandmother. Honestly, I think it would have been better if they'd left out the grandmother and had a girl, living on her own and finding a strange family with talking pandas. The grandmother just does nothing. No Mum. Basically, instead of having Mimiko agree to "be Pan-chan's mum" I'd just have her agree to help take care of him and have her treated as an older sister. Because the mum thing is the only part of the films that's weird and not in a good way. No More Mute Circus Animals. I don't really think they all need to talk. Especially since most of them appear very briefly. But the Tiger mum could benefit from some actual lines. Especially since her baby talks and has quite a bit of dialogue. And it just comes across as strange that she only seems capable of making actual animal sounds. In the end, Panda Kopanda is an entertaining, endearing children's film. If you're just looking for something that's simple and fun, give it a go. It's not one of Miyazaki's best works, but it is quite good. I'll give it a solid 7/10.